The Diatribe | One large, collaborative diatribe. All good things must come to an end.. and the same holds true with The Diatribe. On April 20th, I will no longer own the domain thediatribe.net, officially ending the life of this blog. Thanks to all the contributors and loyal readers throughout the years. After about a week-long hiatus for technical / upgrade reasons, The Diatribe is back up and running. Then in January, we figured it out. I offered up the idea of moving back to the east coast so that we could reduce the distance variable in this long distrance relationship by 90%. And let me say that there’s a lot to be said about dating someone in the same time zone. In June, I said goodbye to my friends, packed my stuff up and drove cross-country to relocate in Brooklyn. Things got a lot easier after moving to New York. I’d take the bus down to Virginia on the weekends to visit Hillary and the boys, and they’d come up here periodically to hang out in New York — with the end goal of eventually moving in after school got out. And while I do miss San Francisco, I’ve really grown to love my Brooklyn neighborhood and being closer to Hillary made it all worth it. So here I am, on move-in eve. We’ve been counting down the days for over 9 months and it’s finally here. Hillary, Kaleb and Peyton are packed and ready to go. Tomorrow afternoon they’ll make their final drive from Winchester to Brooklyn, to the Park Slope neighborhood that they’ll call home. At one point, Hillary joked about the move being a “Home Invasion,” however I quickly corrected her and called it a “Merger and Acquisition.” I’m very excited to be a part of Team DoLewis. I’m excited to acquire two fantastic boys and a wonderful girlfriend and I’m excited for the merging of our lives. The boys first day here will be Sunday. Father’s day. And while I don’t exactly consider myself a “Father,” just yet.. I’ll celebrate this year’s holiday to “Male Parent/Guardian Day.” Next year, you can wish me Happy Father’s Day. It’s been just over a week since I arrived here in India and it’s been an experience. I’ve particularly enjoyed how friendly everyone has been all around the country. Like many countries outside the US, you need to be a little more assertive than in the States, which puts me out of my comfort zone — but it’s something I’ve been working on. This is particularly true when you’re “waiting in line” or trying to navigate public spaces. With 1.3 billion people in the country, you need to be a little more aggressive to get where you want to go — whether you’re driving or walking. We’ve been working long days, but it’s been quite enjoyable. Our teams are great that we’ve been working with and I’m very impressed with how the project has been going thus far. One of the biggest challenges has been the hours that we’ve been working. We’ve been getting up in the morning to discuss the plan for the day, go to the gym or the pool for a bit, and then head into the office for 4pm. We do a few hours of training followed by several hours working on the floor with the teams to help them out and learn how to handle tickets from the sales teams until 2am or so. The food has been good. I’ve had a few bouts of discomfort due to my acid reflux, but I’ve managed to work through it. I also started trying to figure out Cricket. It started as a way to put myself to sleep, because I had no idea what was going on, it allowed me to have something on the television that I had no interest in — but then it turned into a bit of a puzzle. I’ve slowly been figuring out the rules each day and I’ve got a pretty good understanding of the sport. Baseball is still much more exciting, but it’s interesting. We finished up our shift on Friday and got a 6am flight to Delhi on Saturday morning. From the Delhi airport, we got a car to take us up to Agra, the small town where the Taj Mahal is located — about 3.5 hours north of Delhi. Unbeknownst to use, the driver we hired happened to know a tour guide in Agra, so we found ourselves pulling over on the side of the road only to pick up this well-spoken Indian guide that helped us navigate the monument. The Taj was amazing. The entire structure is made out of pure marble and the work that went into it just blew my mind. The grounds were beautiful and the structure itself was breathtaking. 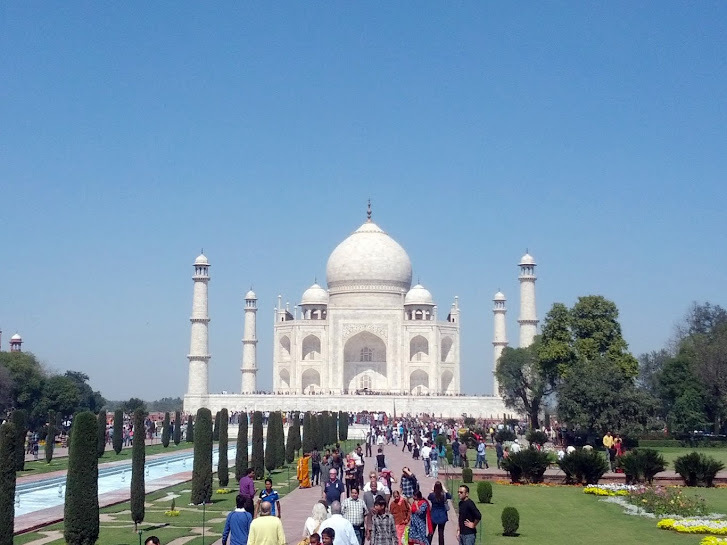 I started playing around with the new “Photosphere” feature on Android 4.2.2, so be sure to check out the 360′ Photosphere Picture that I created of the Taj Mahal grounds. After the Taj, our guide recommended a place for lunch where I was able to witness a real, live snake charmer. I was very torn between wanting to stay to watch him and run away. We made it back to Delhi around 8pm and witnessed a lot of very very poor neighborhoods of the city. Delhi is home to 17 million people and it’s very apparent. One fact that we quoted frequently throughout the weekend was that the traffic in Delhi is the equivalent of the population of Sweden. Insane. On Sunday we had most of the day to do some touristy things before we had to head to the airport. We ended up getting a car for the day and having someone from the hotel drive us around to show us the city and some of the sights. These included the Red Fort, the Lotus Temple and the Qulib Minar (a monument to the oldest Mosque in Delhi). Click the links for 360′ photospheres of each. The weekend really gave some perspective to India — allowing me to see the differences between a city which has developed as part of the technology boom and one that is hugely over-populated. I saw several things that were quite shocking throughout the week, but I also saw some very beautiful monuments and met some very nice people. So far, I’ve been enjoying the trip, but I’ll also be very glad to head home later this week. Everyone here is super nice — I knew that coming into this trip, but I figured it was worth calling out. Immediately stepping out from the airport, the air felt warm and tropical, but there was a scent in the air that smelled as though something was burning — more like incense than anything particularly unpleasant. They drive on the left side of the road — I should’ve guessed knowing that they were colonized by the Brits — but who knew?! The cars are tiny (like most of the rest of the world) but the trucks are HUGE! The cabs of the trucks remind me of a NYC Garbage Truck, much taller and wider than Tractor Trailers in the US with huge glass windows and no doors. Speaking of trucks, many of them have colored lights on the side of them — including a few that looked like they had Christmas lights on the side. I had been warned that people drive crazy, but I didn’t quite know what that meant. Essentially, people will drift in and out of lanes and they generally honk when they’re passing because they want the person to not drift into their lane. I haven’t seen any elephants on the road yet, though. As strange as this might sound, the commercial area I passed reminded me a lot of burning man. Everyone on motor bikes (rather than bicycles), people clustered together riding in groups and sitting on the back, people walking in the middle of the road, tiny little cars that I’d consider mutant vehicles, against a desert-like backdrop where many of the stores are light up with christmas lights and other glowing things to catch your attention. It’s reminiscent of Black Rock City without the booming techno soundtrack. Security was really tight at my hotel. They searched the car for bombs and then upon entering the hotel I had to go through a metal detector and my bags were x-rayed. The hotel is gorgeous, though. The gentleman at the front desk brought my luggage up to my room and he walked inside with me and insisted that I sit down at the desk while he told me all about the hotel and its amenities for 5 minutes. I felt slightly uncomfortable. I’ve only been here a few hours and it’s already been an interesting trip. I’m not quite sure what to do with myself now though — I’m not exactly sleepy, but I’m exhausted from travelling… Oh well. That’s Jet Lag for ya. I figured I’d do a little blogging while I’m on this two-week work trip to Hyderabad, India as part of my “Trip report.” I feel like I do most of my blogging while I’m traveling — but whatever. Anyway..
One of the coolest features, though, was channel that let you switch between three cameras that were mounted on the outside of the plane to see what was going on outside. Having just about the whole row to myself, I had one TV permanently set to the Tail Camera to see what was going on outside. With all the film choices, I ended up watching Looper first. I’ve been infatuated with this concept and was really excited to sit down to watch it. I fell asleep 2/3 the way through. Go figure. I woke up about an hour later and ended up watching a few other films: “Deadfall”, which I rather enjoyed, and “Safety Not Guaranteed” — a clever comedy about a guy that took out a classified ad looking for partner to go back in time with. I think this one was my favorite. The Dubai Airport is quite nice. I’ve never been to an arab country before and while I would’ve liked to have taken a quick tour of the city, I didn’t feel like I really had enough time and didn’t want to risk missing my flight. I recently purchased an an audio book on Audible.com entitled “Meditations to Change Your Brain: Rewire Your Neural Pathways to Transform Your Life” by Rick Hanson and Rick Mendius. The authors, a neuropsychologist and neurologist respectively, have done extensive studies on the eastern traditions of Buddhism, meditation and yoga and how they impact the brain. I highly recommend this audio book, as it not only discusses the science behind these traditions, but it also incorporates several different guided meditations that are designed to change your brain. As you can imagine, this is a topic that resonates with me greatly, so I figured I’d try to distill some of the information that I’ve learned from their book and share it with my readers. In Buddhism, there is a concept known as suffering or dukkha. The way I see it, “suffering” is synonymous with pain, anxiety or stress. Anything that causes discomfort in our daily lives, be it conscious or unconscious. But, as it turns out, we’re all hard wired to experience discomfort and suffering. Why? Because it’s one of the primary mechanisms through which life has been programmed to survive..
As human beings, there are six main reasons why were are biologically predisposed to this stress and anxiety. Every organism needs to know the boundaries between itself and everything else. For most animals, it our skin. But even down at the cellular level, every cell must know the difference between itself and another cell. This creates a duality in our perception: there’s me and then there’s not me (or the rest of the world). The existence of this boundary allows our brains to more quickly process information and threats. It’s an easy way for our brain to cut tasks in half to make them more manageable: inside stimuli vs. outside stimuli. But when you go down to the atomic level, this distinction doesn’t exist. The atoms in your skin are bumping right up next to the atoms in the air and on whatever it is you’re sitting on at this moment. At the same time, there’s a constant exchange of matter and energy. You eat food, which breaks it down into chemicals, to fuel your body with energy, to allow it to function and do all the tasks that we ask of ourselves every day. At the same time, your body is constantly trading oxygen for carbon dioxide. Atoms outside our bodies become part of us and our atoms become part of our environment through these processes. A year from now, 98% of the atoms in your body will not be the same ones that are in your body today. Our brains not only have to monitor all of the internal and external activity, but there also has to be functions that are watching all of this activity and responding to it. There are circular circuits in the nervous system specifically designed to watch the function of other systems in the nervous system. Someone has to fly this ship, right? When you think about your body in this way, we begin to relate external experiences with ourselves, explaining why we take things personally. All of the various drama and stories that we witness, we envision it as happening to ourselves — causing suffering or stress. All animals have it imprinted in their DNA that they have to do whatever is necessary to survive. Throughout human history we’ve been trying to protect ourselves from being the prey of some predator. Our brains are programmed to constantly scan our environment for potential threats. Even when we’re asleep, our brains are ready to act in a moment’s notice if there’s a threat. So much so, in fact, that our circadian rhythms cause us to wake up on average ten times a night to check the status of the outside environment. This internal warning system is constantly engaged in measuring the risk of potential threats to our existence. Maybe now you can start to see now why meditation and yoga are so beneficial. These activities allow us to focus solely on the internal stimuli and thus relieve the brain of some of its duties of worrying about external “threats”: things going on at your job, in your personal life, your grocery list, etc. But, I think this also can help explain why we all find the practice of meditation so challenging. Everything changes. The planet is constantly changing — rivers, tectonic plates, the wind, trees growing, etc. The same holds true for the rest of our universe — everything is always in a constant state of flux — up until the inevitable point at which, billions of years from now, Earth and our entire solar system will be consumed by the sun. So, if everything is always changing, that means that we always need to pay attention. Nothing will ever be still for one moment. So at the same time that we’re trying to adjust to all of this external stimuli, we have the exact same thing going on internally. We encounter input all day, from all different sources that our brain constantly has to process. Neurons are constantly firing to perform different tasks, sending and receiving information from the other systems in our bodies. Then, add in the constant death and rebirth cycle of all of the neurons themselves. All the while our complex systems of the brain are trying calibrate itself to the equilibrium point from all this stimuli. Quite a Sisyphean task! But while all of this helps us to survive, you can probably imagine how this might deter us from being able to quiet down our minds. Lastly, the most basic questions that any cellular organisms is faced with is: approach or retreat. Absorb or reject. For us humans, we view this behavior as the concept of likes and dislikes. It’s what motivates our species towards pleasure and makes us retreat from pain, anxiety, discomfort. So.. how do we combat this? We need to take some time out each day to quiet our minds and reduce the inputs that our brain needs to try to register. But, just like any other activity that you do: doing a sport, writing, playing music, drawing, difficult conversations, selling cars, it requires practice. Practice makes perfect, right? Meditation and yoga are just two examples of that focus on turning inwards on ourselves and allowing our brain to focus on the internal systems and thus temporarily reduce our suffering and stress. From a physiological perspective when we meditate there are three main areas of the brain that are activated: The orbital frontal cortex, the anterior cingulate cortex and the insula. The orbital frontal cortex is the portion of the brain located directly behind the eyes and it’s responsible for all the executive functions of the mind. It’s the CEO: Evaluating tasks, Keeping everything on task, Making decisions, etc. It takes the lead in organizing the neurological activities required. The insula is the located near the ACC, but it straddles the right and left hemispheres of the brain. It’s the internal monitor of the systems, but it also insula: Near the ACC on both sides of the brain. Senses the interior state of the body, but it is also the bridge between the thinking and feeling portions of the brain. If it sense pain somewhere, it sends this signal to the pre-frontal cortex to decide what to do with this information. Scientists have observed other peole that perform similar inward-focused activities and they’ve seen similar patterns in brain activity. For example, in studies in which the brain activity was measured in monks and nuns during their spiritual activities, they found these same areas of the brain light up. So, if you think about it, religion is more connected through neurology and biochemistry than in the principles of the religion itself. So, what does meditation do to your brain? Just like muscles, when you use various parts of the brain for these tasks, they get stronger. Meditation trains our attention and interoception: our gut feelings and intuition. It improves our self-awareness and self-understanding. Meditation also trains what’s known as our our meta-attention, which is how we attend to attention. This is particularly useful when trying to teach ourselves new things. Brain activity in the insula has been linked to a human being’s capacity for empathy — a social skill to communicate with other people. MRIs have shown that the more we experience empathy, the more our insula lights up. At its root, empathy is our sense of compassion, loving kindness and how relate to other human beings. It allows us to communicate with other beings because we can understand their wants and needs. This also allows us to connect to other people because we know what they’re going through. In fact, neuroscientists have found that some of the exact same cells in our insula activate just as if we, ourselves, were feeling that feeling. Meditation is also found to release chemicals in our brain associated with pleasure such as dopamine and norepinephrine. It’s as though our own brain is rewarding us for doing this practice. By working our ACC, we’re strengthening the ties between what we think and what we feel. The more we do this, the more we wire these connections together — which helps improve overall brain function. Deterioration in the ACC has been known to cause diseases such as Alzheimer’s and Dimentia. Meditation also has more permanent effects on the brain. For example, people who meditate more frequently are often found to be sending out brain waves that signal that they are content and happy. It’s also been found to increase serotonin levels in the brain, which also leads to our overall happiness. People who meditate often have more brain activity in the left frontal lobe of the brain which are generally used to promote positive feelings, compared to the right frontal lobe which promotes negative feelings. Regular practitioners are also found to have thicker brain layers in the areas that relate to attention (up to 1mm in some cases!). The thicker the brain matter in these regions, the more brain cells, the stronger they become. Most importantly, the practice of meditation seems to have a “dosing” effect on the brain. What this means is that the more you meditate, the more these changes occur in the brain and the longer they last. Just like weight training, the more you work out the more muscle you’ll build, the longer it would take to lose it. When scientists measure the brain states during meditation, what they’ve found is that it generally triggers the exact same portions of your brain that are associated with all of the other pleasurable activities that you enjoy in your daily life. So as you get better at meditation, you are thus strengthening your brain and teaching it how to deal with day-to-day stress, increase attention at work, and do more critical thinking. All this, while being rewarded at the same time. Ever since I left Memphis, I’ve not really had a lot of downtime in the evenings to update the Ethernet about my adventures. Needless to say, I’ve made it to New York. The last leg of my journey begins today when I head up to Boston to drop off my car with my mom. It’s going to be quite sad to part with her after this incredible bonding experience, but I know she’ll be in good hands. Anyway, I left the hotel in Memphis on Thursday morning and headed to Graceland. Prior to starting my trip I had no desire to see Graceland, but after several people had highly recommended it (including the woman at Cadillac Ranch who said that Graceland was the highlight of her trip), I figured I should probably stop by. I’m very glad I did. I have so much more respect for Elvis Presley after learning about his life and seeing his home. He’s one stylish m*therf*cker. His house was out of control. I only snapped one picture on my phone, so you’ll have to wait until I upload the rest from my camera to see what I’m talking about, but this place was amazing. 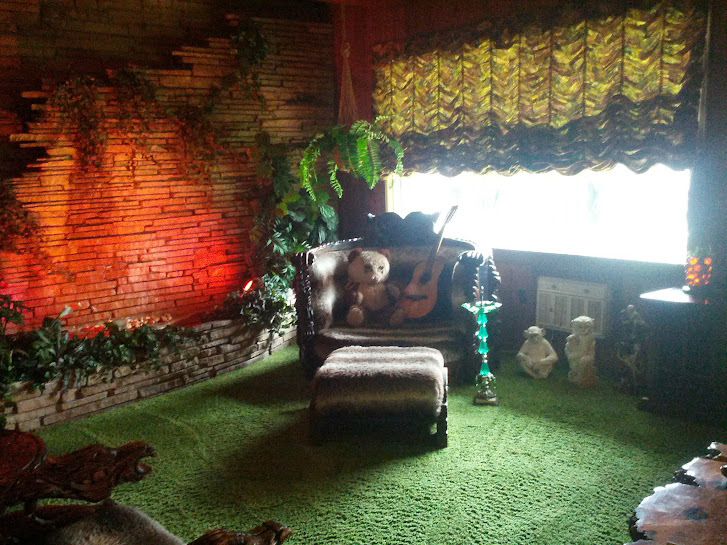 This was the “Jungle Room.” Complete with a working waterfall that comes down the brick wall and the entire floor, ceiling, and walls covered in this green plush carpet. I realized that Elvis really was a Rock God — and he knew it. He was damn cool. I left Memphis and took the three hour drive across the state over to Nashville to visit my sister and my nephew. I hadn’t seen them since he was a week or two old, so it was incredible to see how much he’s grown and what he’s able to do now. I can’t wait to see how he grows up. I’m glad that I’ll be closer to both of them, being in New York, and get to see them more frequently. Friday, I drove 7.5 hours over to Waynesboro/Charlottesville, Virginia to spend the night with Hillary. This was the first time that I found myself too exhausted to drive during the middle of my cruise. I had to stop at a gas station somewhere in Tennessee and take a quick cat nap because my eyes were wanting to close just too badly. Hillary lives two hours north, but we met down in this area because she was going to participate in a Yard Sale that her storage unit company was hosting to help clear out some of those unwanted items that she’s had laying around. It was so great to see Hillary and meet all her old friends that live down in that area. I felt as though she was somewhat of the prize at the end of my journey. It was wonderful to have people to talk to in the evenings. My entire trip has been spent talking to strangers in 5-10 minute increments and then being on my way. So, to have my sister and hillary to talk to for an entire night was awesome. Thus the reason for the lack of posting. On Saturday, we had the storage unit yard sale. It wasn’t as successful as we had planned, but this is namely because the storage company failed to properly advertise the event so there weren’t enough shoppers coming through the fenced-in area. They plan on doing this same thing the first Saturday of every month, so it’ll be better next time — we hope. I left Hillary bound for New York City around 3:30. Two hours later, I had just crossed the West Virginia state line and I was exhausted and couldn’t drive any further. I pulled over at the welcome center and napped again. I used to feel that napping was cheating, but you really only need 30-60 minutes of sleep to feel rejuvenated and ready to hit the road again. By 11pm, I was entering Manhattan. The sight of the New York skyline was SO surreal. I couldn’t believe that I was actually here. I had been in Arizona and the Grand Canyon just days earlier — and here I was in New York City. Wow. Navigating through northern New Jersey, Manhattan and Brooklyn to get to my place was a nightmare. I never thought I was going to make it. I got to my new apartment around midnight and began to unload my car and drag everything up the four flights of stairs. Painful. I forgot how awesome my new apartment is, though. I had a hard time sleeping because I was too excited to start taking things apart and putting stuff away. I don’t think sleeping on an air mattress in a room without window shades helped, but whatever. So, here I am. I’m getting ready to start the last leg of this cross-country trip and head up to Boston. It’s been the most amazing experiences I’ve ever had and I’m sad to have it all come to an end. The fact that I have to go to work on Monday just doesn’t make sense to me. But, I’ll get used to it. Now.. if only I can get the movers to drop off my stuff — I can start to get settled. Cumulative Mileage: 2675mi ~~ Total Travel Time: ~7 hours. Exhausted doesn’t even begin to describe how I’m feeling tonight. I’m a block away from Beale Street, the nightlife center of Memphis and I’m back in my hotel. Texas is draining. The drive today was very difficult and tiring. I think I went through 2 cups of coffee, a five hour energy, and two redbulls all before noon. Before I left Dallas, I wanted to find a good place to get a real “Texan Breakfast.” After asking three different people, all of them recommended IHOP. Really? IHOP? Texas. So, I go to IHOP and the waitress asks me “Smoking or Non?” Really? That’s gross. Texas. I order some ridiculous meat-laden omelette and have to specify that I want my omelete made with real eggs rather than buttermilk pancake batter. Really? IHOP. Texas. I don’t even know. As soon as I get back to my car, it starts pouring. Thunder. Lightning. Hail. You name it.. I got my storm. As I was leaving Dallas, I kept looking along side the highway for signs of Tornados, but fortunately I saw none. I made it just about to the Arkansas border when it cleared up. Texas. 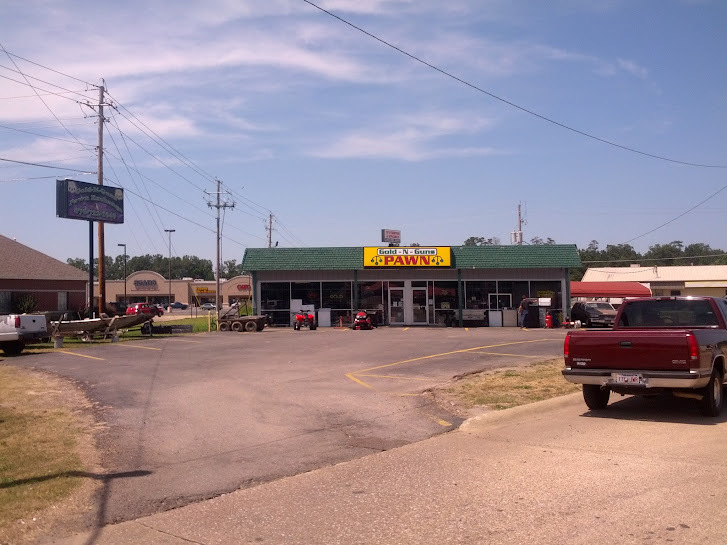 My original plan was to stop in Little Rock for lunch, but it was too far and I was too tired and hungry to make it there. I ended up stopping at the birthplace of William Jefferson Clinton, Hope Arkansas. It was very unexciting and I ended up having lunch at Wendy’s. I broke my streak of non-chain restaurants. Sigh. I make it through Little Rock and get back onto Highway I-40. I was very relieved to make it back onto 40. I had been on 40 from Bakersfield to Amarillo and will be on it pretty much all the way to Virginia. I feel as though the driving got very challenging when I was off of highway 40, so it was comforting to be back on my main route. That was until I hit the Wattansaw State Game Area. There was a sign that said “Construction ahead, expect delays.” I had seen this multiple times in the past and didn’t expect any issue. I was wrong. I was at a dead stop for over 30 minutes and didn’t get out of traffic for over an hour. It was unbearable. This was really the first traffic I had hit since my first day on the road, so I’m considering myself lucky. I’m also very fortunate that I wasn’t going westbound, because as I was stopped I had noticed that there was NO traffic going west. Not a single car the entire time I was stopped. Strange. I realized that both East and Westbound of 40 had construction down to one lane, but still, why wasn’t there cars? After a while, when we started moving I noticed there was a Red PT Cruiser on the other side of the highway parked with all four doors open. The family that owned the car was sitting outside of it, eating and talking to some policemen. Behind them sat 20 miles of traffic at a dead stop. Everyone was out of their cars hanging out. Nobody had a clue as to what was going on — not even me. I felt bad for all these people. 40 West was a parking lot. It still is, according to Google Maps. I wonder if those people are all still there. I was expecting to get to Memphis by 5:30. I ended up getting to my hotel just before 8pm. I blame Texas. 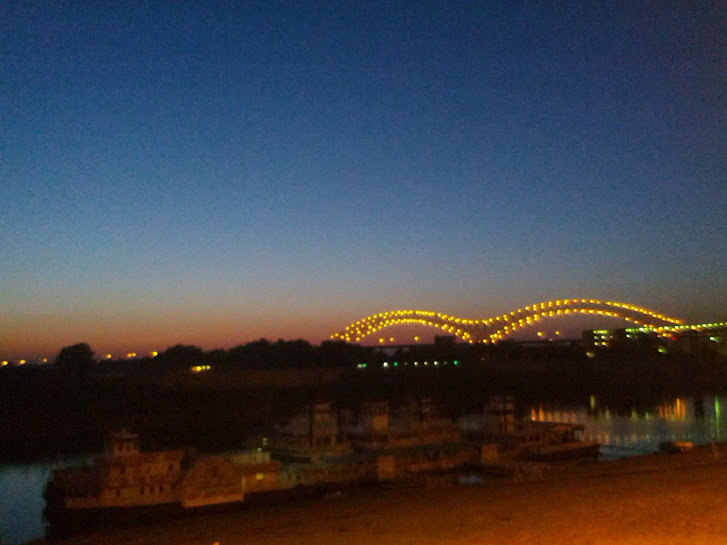 If you’ve never been to Memphis, I highly recommend it. Beale Street is a very happenin’ place. I wish I had more energy to go and enjoy it. I’ve never seen so many tricked-out motorcycles. 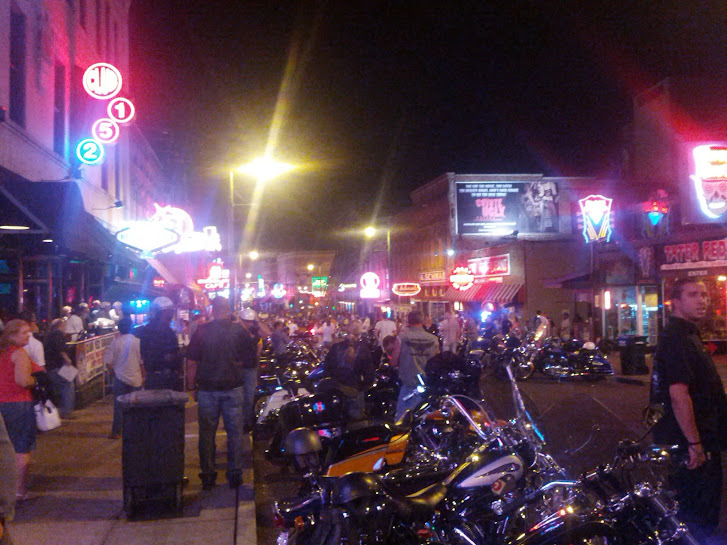 I guess it’s what you’re supposed to do if you live here — get on your hog and drive it down to Beale Street. The street smells like Barbecue and has music coming out of every store/bar/restaurant/club. It reminds me a lot of New Orleans, actually. Of course, I had to have some Memphis BBQ while I was here and I ended up going to an amazing place called Charles Vergos’ Rendezvous. Unbelieveable. Some of the best ribs and brisket I’ve ever eaten. After dinner, I walk down the street and notice some sort of stadium-type place. At first, I thought it was a horse track because there were no turnstiles to get in and there were people cheering. Upon closer inspection, I realized that it was a baseball stadium for the Memphis Redbirds. Apparently, they take down the turnstiles after the 7th inning and let anyone into the park. Lucky for me! 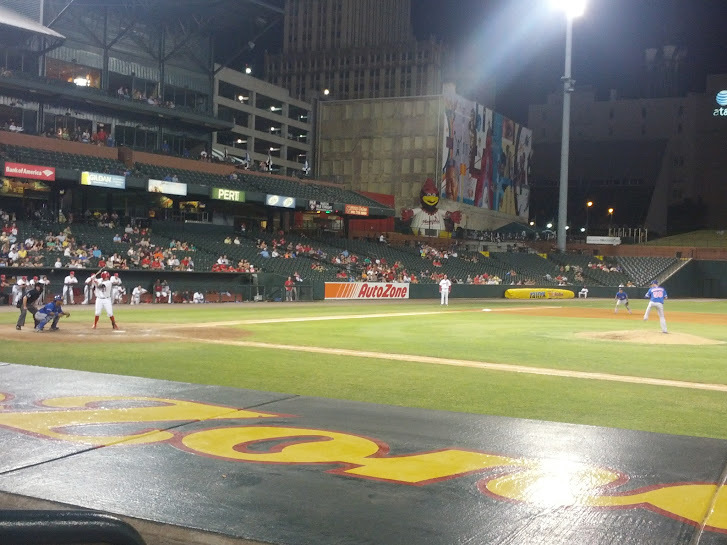 I walk in and it’s 2-2 in the top of the 8th, the Redbirds (AAA St. Louis) are playing the Round Rock Express (AAA Texas!). Ryan Spilboughs was the only player I recognized. He played in Colorado for 7 seasons including the 2007 World Series against the Red Sox (0-10, 2BB, 2 SO). The Express went up 3-2 in the top of the 8th and the Redbirds answered right back in the bottom. Bottom of the 9th, two on, two out, a ground ball single to the right fielder scores the run from second. It was almost a close play at the plate, but the Redbirds rallied to win the game. All things considered it was a pretty exciting two innings. I even got to see some guy by the name of Hamburger pitch. After the game I walked around Beale street for a little bit to see if there was something that caught my ear. Unfortunately, I was just too tired to deal with it. So, here I am. I hadn’t planned to write much this evening — I thought it was a pretty uneventful day. But, turns out I had plenty to say. Tomorrow, I am planning on checking out Graceland while I’m here. I’m not an Elvis fan, but why not, right? After that, I head to Nashville to see my sister, her husband, and my nephew Henry. It’s only a 3.5 hour drive it’s going to be a much-needed day of rest. Good night, Etherwebs. Cumulative Distance: 2132mi. ~~ Total Travel Time: ~8 hours. Whew. That was a long day. Driving through Texas has been the least exciting day thus far — I had to stop for coffee several times and even busted out two five-hour energies along the way because Texas is just so damn boring. 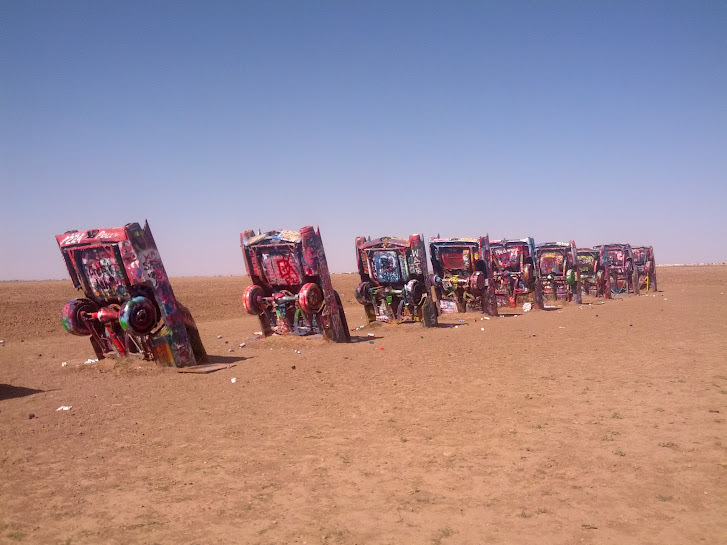 My first stop of the morning, though, was at a “Texas Landmark” known as Cadillac Ranch. There are essentially ten cadillacs that are buried, nose first, into the ground in the middle of a field. Visitors are encouraged to spray paint and decorate them. You can imagine how much paint there are on these vehicles at this point. 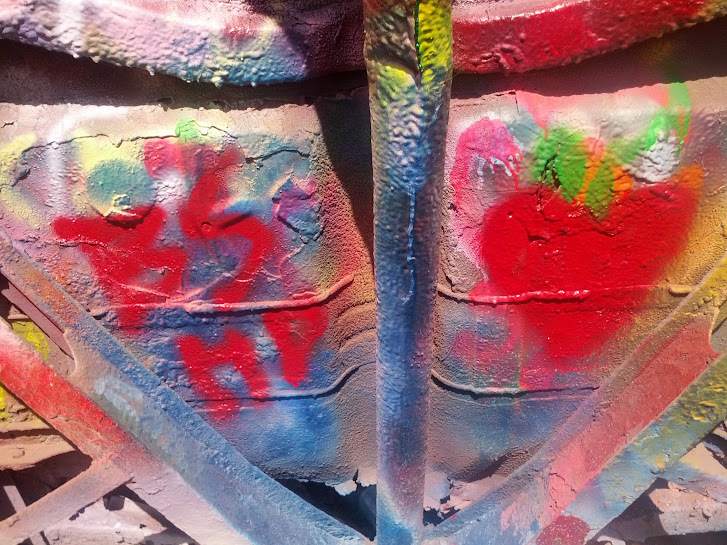 On one spot, the paint was starting to chip and it was about 1/4″ thick — and there was still spray paint showing. So, who knows how thick the stuff is. There are no signs or explanations of the exhibit. It’s just there in the middle of a field with a sign that says “It’s against Texas law to spray paint anything on this side of the barbed wire fence.” Other than that, you just need to park on the side of the highway and walk up to it. After a while here, I hit the road towards Dallas — and it was rough. Nothing but very boring farm land, much worse than Eastern New Mexico. If this is any hint of what’s in store for me tomorrow, I’m very worried. One thing I noticed about Texas, though, is that there is an insane number of white trucks. Everyone has a white pickup or white SUV. Everyone. I couldn’t believe it, so for a ten mile stretch I started to count all of the ones I could find excluding Semis, Vans, and Car Dealerships (I saw two truck dealerships and they had a lot full of hundreds of them! I SWEAR!) After ten miles, on the highway I counted 128. That’s 12.8 white trucks per linear mile.. How is that even possible? If you own a white truck and go to a baseball or football game, how do you find your car?!? There’s also a ton of churches and Jesus signs across the entire state. I think my favorite that I saw was “Jesus Doesn’t Tapout” with the MMA Tapout Logo on it. Classy. I stopped for some Texas Barbeque somewhere in Wichita Falls. 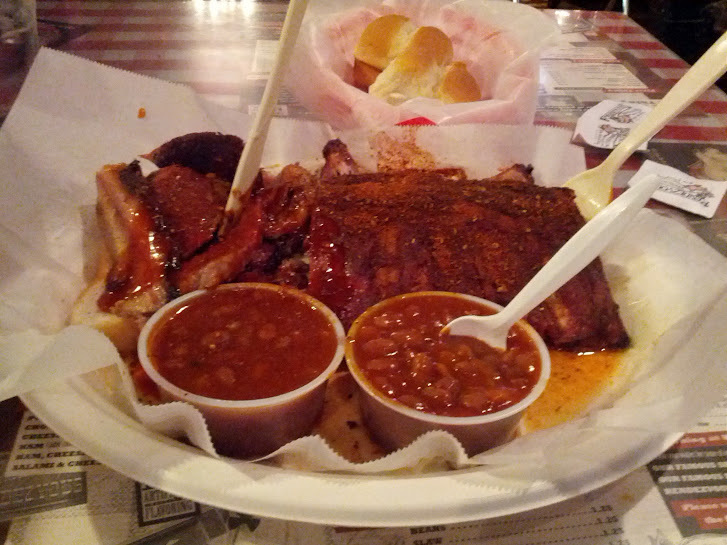 It was the highest rated BBQ place in the city and it was pretty damn good. One thing I found very peculiar, however, was some “memorabilia” they had hanging on the wall. 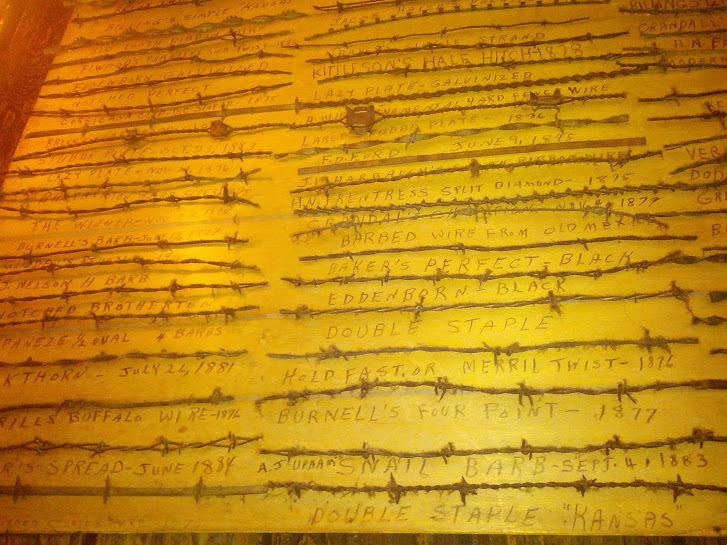 It was a piece of wood with almost 100 different types of barbed wire attached to it, each with a name and the date on which it was created (?). Who knew there were so many different kinds?! Only in Texas. I got into Dallas/Arlington/Fort Worth around 5pm and planned on going to a Ranger’s game. Turns out my hotel shares the parking lot with the Rangers Stadium at Arlington, so it was a quick walk over to the ballpark. I scored some great seats behind home plate and got to watch the Mariners thump the Rangers 10-3. Andrus had two errors at Short Stop which directly led to 3 Seattle runs. Oddly enough, too, Ichiro had 1/3rd of the putouts for the entire game. He caught 9 flyball outs in Right, three of which in the 4th inning. Strange. I sat 12 rows behind Nolan Ryan — who is named after EVERYTHING in the ballpark. If George W. had been there, I would’ve been peanut-throwing distance from him. I guess he heard I’d be in attendance. Tomorrow, I’m headed to Memphis by way of Arkansas. Hopefully it’s more exciting than today — I can’t do another 8 hours of boring landscape. I’ve heard there’s supposed to be some thunderstorms tonight. I’ve got the shades open to try to catch some of these exciting storms. I’d rather watch them from the safety of my hotel room rather than from my car — especially as I drive through Arkansas.